If you like Popular Information, please spread the word. Candor. Ultimately, that's all any Supreme Court nomination hearing is all about. Brett Kavanaugh, like nearly all Supreme Court nominees, is intelligent enough to know what he needs to say to get confirmed. The question is whether to believe him. There were several significant lines of questioning on Wednesday that raise questions about whether Kavanaugh is being candid with the Senate Judiciary Committee. In November 2003, Manny Miranda, a Republican staffer on the Senate Judiciary Committee exploited a weakness in the Senate computer system to access emails from Democrats. He then shared them with right-wing news outlets and others to disrupt the opposition to nominees from then-president George W. Bush. Did Kavanaugh, then working on judicial nominations at the Bush White House, know anything about the stolen documents? Kavanaugh was asked about the issue during his 2006 confirmation hearing when he was nominated by Bush to be a federal appellate judge. His answer then was a flat no. DURBIN: Manny Miranda was an employee of the Judiciary Committee on the Republican staff and then on the Senate Majority Leader's staff. He hacked into the computers of the members and staff of this Committee, stealing thousands of documents and memoranda which were then shared with others...Did you ever work with him in terms of judicial nominations? Kavanaugh was confronted with his statements on Tuesday by Senator Pat Leahy (D-VT). "Did Mr. Miranda ever provide you with highly specific information, regarding what I or other Democrat Senators were planning, in the future, to ask certain judicial nominees?" Kavanaugh studiously avoided answering the question. So Leahy got more specific: "Did Mr. Miranda send you [an email] -- on July 19, 2002 -- asking you and another Bush official why the Leahy people were looking into financial ties between two special interests groups and Priscilla Owen, a particular controversial nominee to the 5th Circuit?" Kavanaugh asked for a minute to read the email containing the stolen information. The room went silent. Finally, he gave an answer. "I don't have a specific recollection of any of this, but it would not have been at all unusual for -- and this happens all the time I think," Kavanaugh offered meekly. Leahy went on to reveal that in an email two days before the Priscilla Owen hearing, Miranda told Kavanaugh that "Democrats were passing around a 60 Minutes story and his intel suggests that Leahy will focus on all things money." Leahy noted that the information came from an email stolen from him by Miranda. Kavanaugh insists this was all standard. So Leahy turned to another example: "In January 2003 -- let me go to something specific -- Mr. Miranda forwarded you a letter from me and other Judiciary Committee Democrats to then-Majority Leader Tom Daschle. The letter was clearly a draft. It had typos, and it wasn't signed… But here's the thing, you had the full text of my letter in your inbox before anything had been said about it publicly. Did you find it at all unusual to receive a draft letter from Democratic senators to each other before any mention of it was made public?" Kavanaugh did not answer the question. He emphasized his reply: "Who signed this?" -- apparently believing that is exculpatory. Leahy had another question: "Did [Miranda] ask to meet with you privately to give you information about Senator Biden and Senator Feinstein?" "It's certainly possible," Kavanaugh replied. Another question: "Did you ever receive information via Mr. Miranda, information marked confidential informing you what my staff was sharing with other Democrats?" Kavanaugh appeared concerned he had and crafted an answer to justify receiving such information. "I don't know the answer to that, Senator. Again, it's not always the case, at least my understanding, that the people on, for example, your staff and Senator Hatch's staff, were necessarily working at odds," he said. LEAHY: You never received an e-mail from a Republican staff member with information claiming to come from spying, a Democratic mole? KAVANAUGH: I'm not going to rule anything out, Senator, but if I did, I wouldn't have thought that the literal meaning of that. LEAHY: It wouldn't have surprised you that you got an e-mail, saying you got that from somebody spying. KAVANAUGH: Well, is there such an email, Senator? I don't know. LEAHY: We have to ask the chairman what he has in his confidential material. Leahy summed it all up: "[T]here is evidence that Mr. Miranda provided you with materials that were stolen from me. And that would contradict your prior testimony… Mr. Chairman, there are at least six documents that you consider committee confidential that are directly related to this… There is simply no reason they can be made public." There are two issues here. First, what kind of material is Chairman Chuck Grassley (R-IA) continuing to shield from public view? Second, based on what is already public, is Kavanaugh's insistence that he did not know he was receiving stolen information credible? Should someone who misleads Congress about such a serious matter be trusted with a lifetime appointment to the Supreme Court? Senator Dianne Feinstein (D-CA) queried Kavanaugh on the critical question of whether he believes a sitting president can be subject to a criminal investigation. You have said that, and I quote, "If the president were the sole subject of a criminal investigation, I would say no one should be investigating that at all." What did you mean by that and what are the circumstances where a sitting president could be subject to criminal investigation? In response, Kavanaugh said that he has never taken a position on the constitutionality of investigating a president and was instead just floating some ideas for Congress to consider. Here is the bottom line: they were ideas for Congress to consider. They were not my constitutional views. If a case came up that where someone was trying to say this is a constitutional principle, I would have a completely open mind on that because I've never taken a position on the constitution on that question. This is not true. In a July 1998 article for the Georgetown Law Journal, Kavanaugh states that the Constitution "dictates" that a sitting president can only be investigated by Congress -- and not criminally. This is not an academic discussion. If confirmed, Kavanaugh could consider whether Trump is obligated to respond to a criminal subpoena from Robert Mueller. Kavanaugh is telling Feinstein that he has a "completely open mind" on the constitutionality of such a subpoena. His writings prove that is not true. In his 2006 nomination hearing, Leahy asked Kavanaugh whether he saw documents related to the NSA's warrantless wiretapping program. Kavanaugh responded that he had not and only learned of the program when the New York Times reported it in December 2005. LEAHY: Did you see documents relating to the President's NSA warrantless wiretapping program? KAVANAUGH: Senator, I learned of that program when there was a New York Times story--reports of that program when there was a New York Times story that came over the wire, I think on a Thursday night in mid-December of last year. Leahy returned to the subject on Wednesday and noted that, according to a declassified Inspector General's report, John Yoo -- one of the legal architects of warrantless wiretapping -- showed a memo to Kavanaugh about the program several months before the New York Times article was published. Leahy asked if he had ever worked with Yoo on the issue. Kavanaugh all but admitted he did, saying that, after September 11, 2001, it was "all hands on deck" in the White House. Again, Leahy suggested there are documents proving that Kavanaugh worked on the issue before the New York Times article was published but they were being kept secret by the committee. Mr. Chairman, I sent a letter to you along with Senators Feinstein and Durbin on August 16th of this year asking to make documents related to this issue public. Without them being public, it's not fair to me, it's not fair to Judge Kavanaugh, that I can't have the actual documents, which I think would refresh his memory. Grassley said that he'd consider releasing the documents. HARRIS: Can you think of any laws giving government the power to make decisions about the male body? KAVANAUGH: There are, um, medical procedures? HARRIS: That the government has the power to make a decision about the man's body? KAVANAUGH: Oh, I thought you were talking about medical procedures that are unique to men. HARRIS: No. I'll repeat the question. HARRIS (more slowly): Can you think of any laws giving government the power to make decisions about the male body? KAVANAUGH: I'm not thinking of any right now, Senator. An anonymous "senior administration official" wrote a column in the New York Times that has a lot of people talking. The author describes the president as amoral and claims that "many of the senior officials in his own administration are working diligently from within to frustrate parts of his agenda and his worst inclinations." The author casts themselves and other senior administration officials as "heroes," curbing Trump's worst abuses. They are not heroes. They are collaborators and enablers. Senator Ted Cruz (R-TX) is facing an unexpectedly strong challenge from Democrat Beto O'Rourke. He's getting desperate. A new ad by Cruz, posted to his Facebook page claims that O'Rourke said he was "grateful" Americans were willing to burn the flag. The big problem with the ad is that O'Rourke never said that. The Dallas Morning News notes the "Cruz ad focuses on 43 of 143 words from the question, and 24 of 615 words from the answer." The paper says that the Cruz ad "falsely depicts" O'Rourke making the statement and "hinges on heavy splicing and a creative interpretation of a long-winded comment." O'Rourke, the Morning News states, "did not say he's 'grateful' for flag burning." Rather, O'Rourke praised "the peaceful protest of football players seeking to call attention to police brutality by taking a knee during the national anthem." You can watch the full question and O'Rourke's answer here. Or tweet your thoughts. Some folks even have nice things to say. 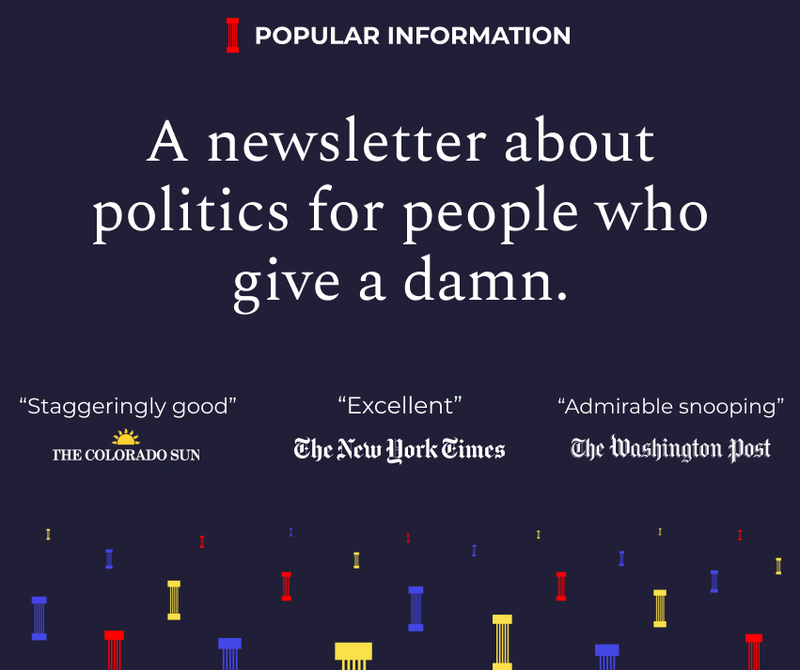 @JuddLegum ‘s Popular Information Newsletter is a new fave of mine!! I love the breakdowns of what’s going on in politics.... has made it easier for me to keep up! Thank you for a well written, well researched newsletter. It's my favorite read!